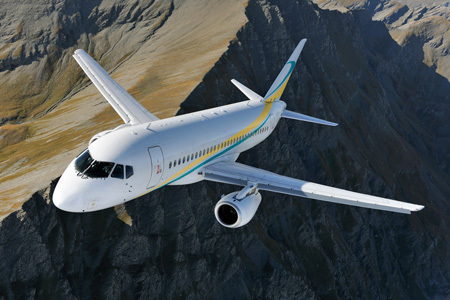 SuperJet International – the joint venture between Alenia Aeronautica, a Finmeccanica Company, and Sukhoi Holding – has announced today a purchase agreement for two Sukhoi Business Jet (SBJ) aircraft plus two additional options, with Comlux The Aviation Group. With this order Comlux becomes the launching customer of SuperJet International for this new type of VIP aircraft. Comlux represents one of the most innovative business aviation group worldwide, able to always offer to its VIP passengers new products for their travel needs. The deliveries of the two SBJ aircraft are planned for the 2014. The order has an estimated value of US $200 million, including options. Before the entry into service, the VIP cabin interior of the aircraft will be designed and outfitted by Comlux America, the completion center of the Comlux Group, based in Indianapolis USA. Comlux America is appointed as the first approved Sukhoi Business Jet completion Center. The Sukhoi Business Jet is the VIP aircraft version of the Sukhoi Superjet 100 regional airliner. It offers a spacious and ultra quiet cabin of 118 m3 / 4192 ft3, and a range of approximately 4300 nm (8000 km), thanks to its additional fuel tanks. The launch of the VIP aircraft version comes just four months after thesuccessful entry-into-service of the SSJ100 in April 2011. “Comlux has gained its reputation in the worldwide business aviation market by offering a unique onestop- shop solution for the widest range of wide-cabin VIP aircraft “ said Richard Gaona, President of Comlux the Aviation Group. “ Combining Comlux expertise in bizjet aircraft transaction, our capabilities of cabin completion in Indianapolis, our Fly Comlux forces to display and charter the SBJ, together with Superjet willingness to be a major player in business aviation, we are looking for exiting time. With this launching order, we are pleased to offer to our prestigious clientele a new choice of VIP aircraft complementing our existing fleet and combining space, comfort, luxury and innovation. Today, the Comlux fleet is comprised of 19 aircraft in service (1 BBJ767 limitless, 2 Airbus ACJ318, 2 ACJ319, 1 ACJ320, 4 Bombardier Global Express, 3 Global 5000, 3 Challenger 605, 2 Challenger 850 and 1 Dassault Falcon 900LX) and 8 aircraft on order or in completion phase (1 Airbus ACJ319, 2Bombardier Global 6000, 2 Global 7000 and 3 Embraer Legacy 650).